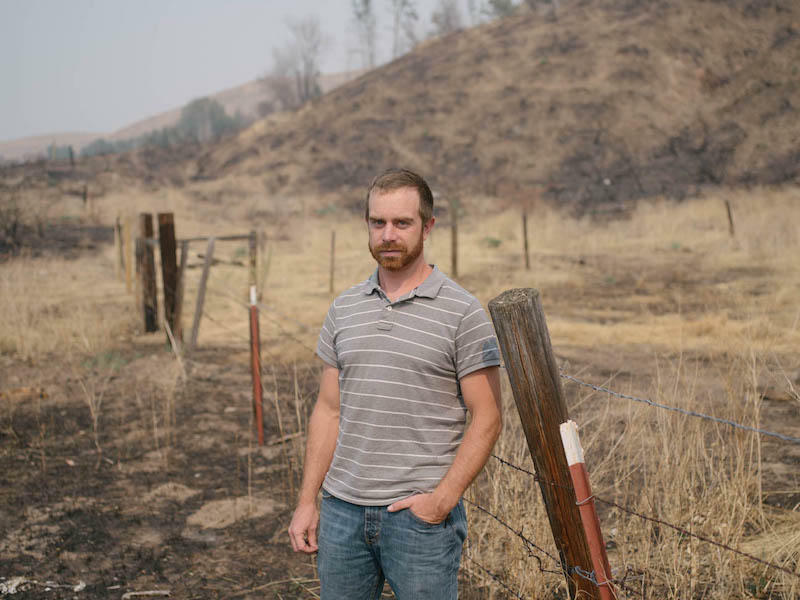 Anna King and Craig Vejraska traveled up into the high mountains outside of Omak to search for his cattle amid the fires. Vejraska had to cut or open many of his fences so his cattle could escape the fires. Kent Stokes says hundreds of miles of fenceline will have to be rebuilt after last year's Carlton Complex and this year's Okanogan Complex wildfires. Cattle ranchers depend on good fences and good neighbors to manage thier lands well. 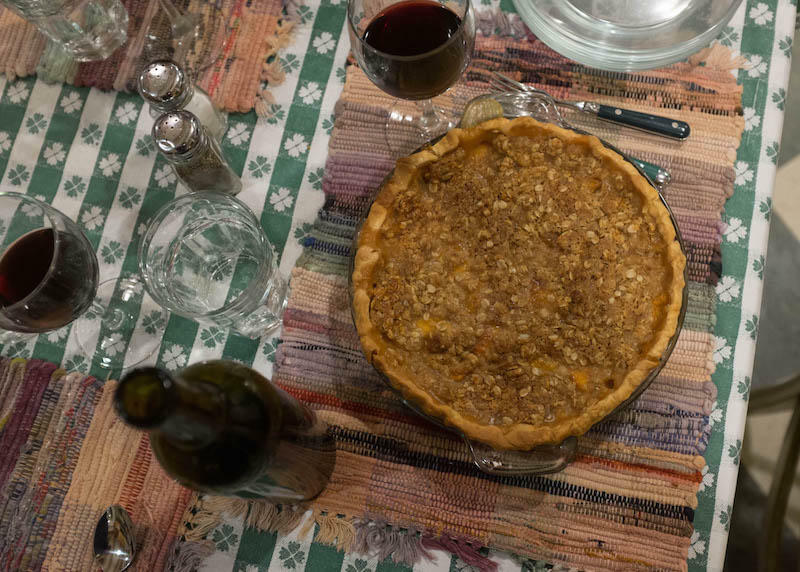 Friends gather at a kitchen table at the Methow Valley Inn to drink, eat and smother worry over fires and smoke with nectarine pie. In the poem “Mending Wall,” Robert Frost lays down the well-worn quote, “Good fences make good neighbors.” In this year’s dramatic Northwest wildfires, ranchers and neighbors are cutting down “good fences” of all kinds. 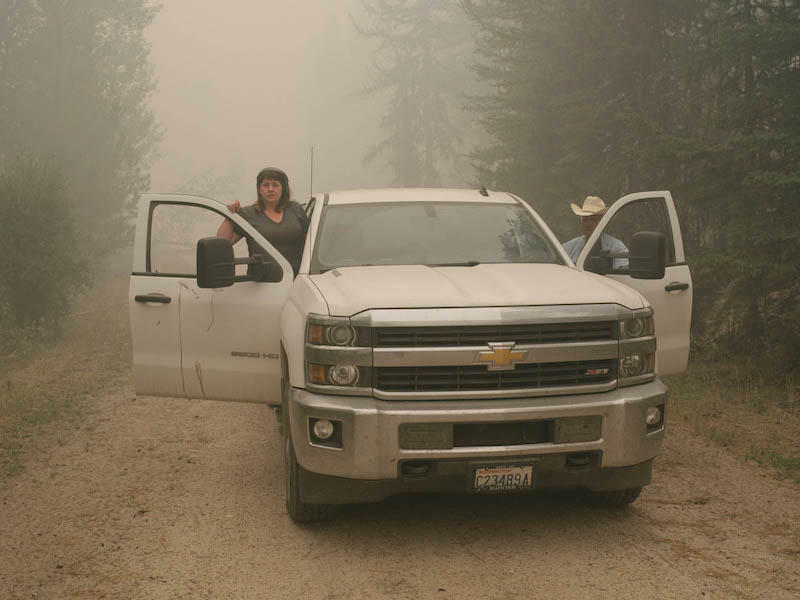 Craig Vejraska went up into the smoky woods of north central Washington state to check on his cattle. He made sure to open gates for the herd. He and the other ranchers outside of Omak have done their best to cut every fence or open gates and let their cattle just roam. Normally they would never do that. Fences make their livelihood possible. There are environmental rules, and patchwork landownership to follow. But now, fences are flung open. It’s up to the cattle to keep themselves ahead of the fires. Even pushed by fire, cattle will obey the barbed wire until it’s too late, he said. So to keep them from getting stuck, Vejraska and other ranchers cut and open as much fence as they can. Smoke enveloped the area and stretched from the ground to the obscured sun. The burning trees and stumps looked like unattended campfires. 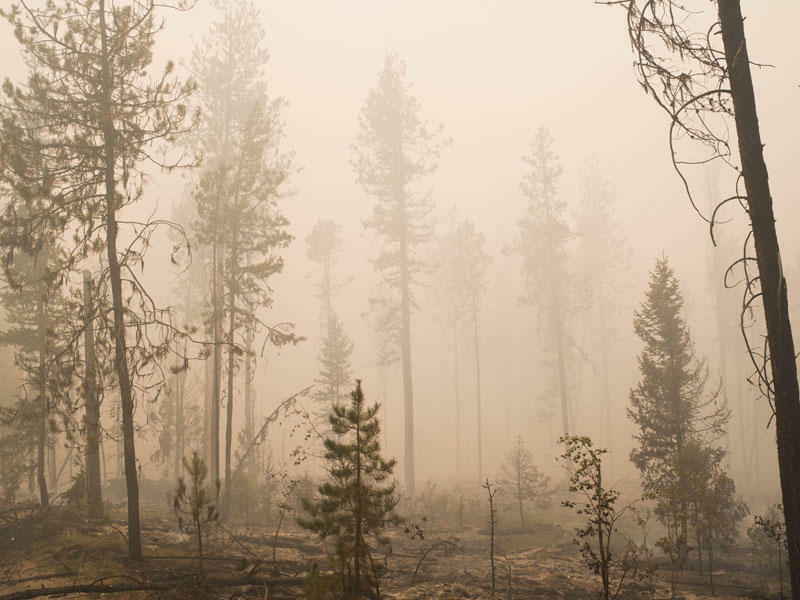 Smoke and ash hung in the air and dusted the forest. Like snow, it made the place eerily silent. And it’s hard to tell where the fires are when you can’t see or hear anything. Kent Stokes is also a rancher. Most of his ranchland burned up in the Carlton Complex last year. More than 22,000 acres. A canyon he thought he’d have days to evacuate burned up and took his home to the ground in under 12 hours. Ultimately, it wasn’t the firefighters that saved his folks’ home or winter haystacks. “The people that really helped us were our neighbors,” Stokes said. Last year the Stokes lost about 60 percent of their cattle -- hundreds of head. 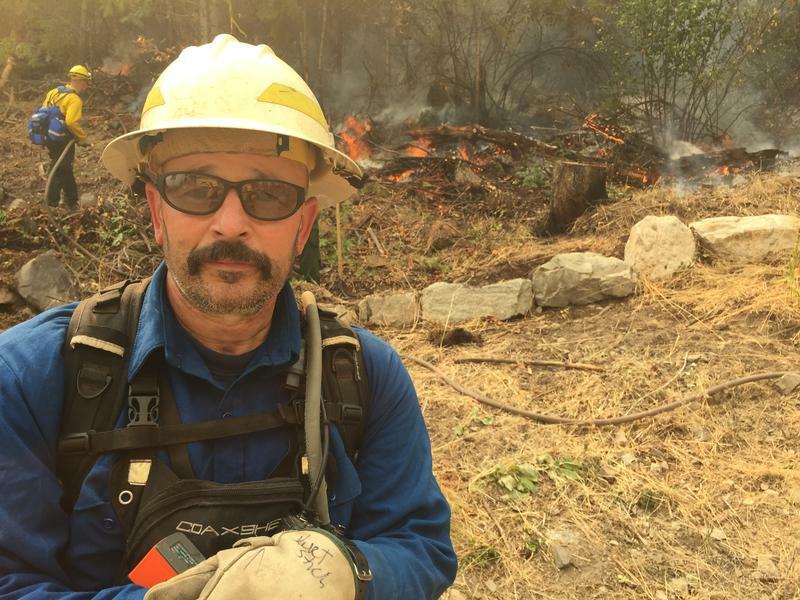 “Instead of thinking that some fire engine from the coast is going to be over here in time when a fire is raging, starting at a local level and having those relationships with the people around you is way more important,” he said. Stokes said what lays ahead for his burned-up neighbors is years of fence building. Some of Stokes’ burnt up fencing was built and seated in the sand and rock by his grandfather. In the old days, ranchers would just turn out their cattle in spring and gather them back in each winter. But now, these five-string barbed fences help ranchers organize and manage the land and keep cattle from overgrazing an area. And building new fence is a huge job. Stokes said it takes two fit men about six full days to build just a quarter mile. Hundreds of miles of fence burned in the last two years. Still, Stokes said neighbors, volunteers and donated materials help. Later, when the fires cool down the ranchers will sort their surviving herds. They’ll be mixed up because of these downed fences. But for now the neighbors -- ranchers, a master woodworker, a wool weaver, the innkeepers and a hay farmer -- file into the Methow Valley Inn’s farm kitchen. They blow off a bit of fire stress by eating well and laughing together. Heavy pours of wine accompany salmon, salads and a nectarine pie. 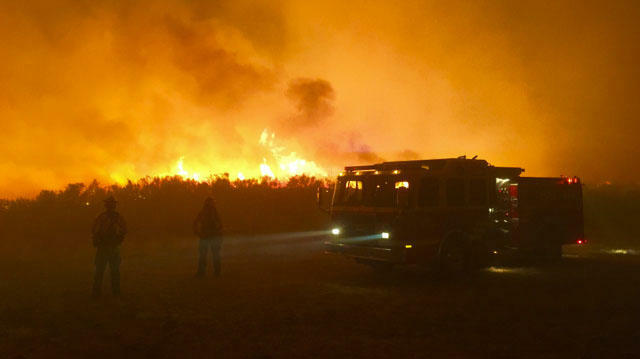 These giant fires move over the landscape, and destroy. They take lives, burn up homes and down fences. But the snow will fly. The fires will cool. Spring will come. And good neighbors will find each other and build good fences again. Wildfires continue to burn across the state and it's hitting ranchers hard in central Washington. 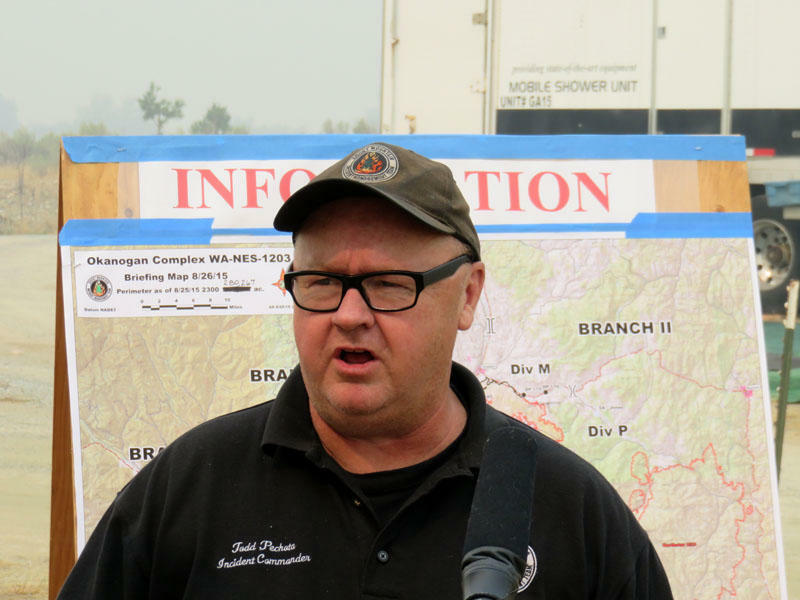 Three firefighters were killed Wednesday in the wildfire near Twisp, Washington. Another 3,000 are currently on the job around the state. 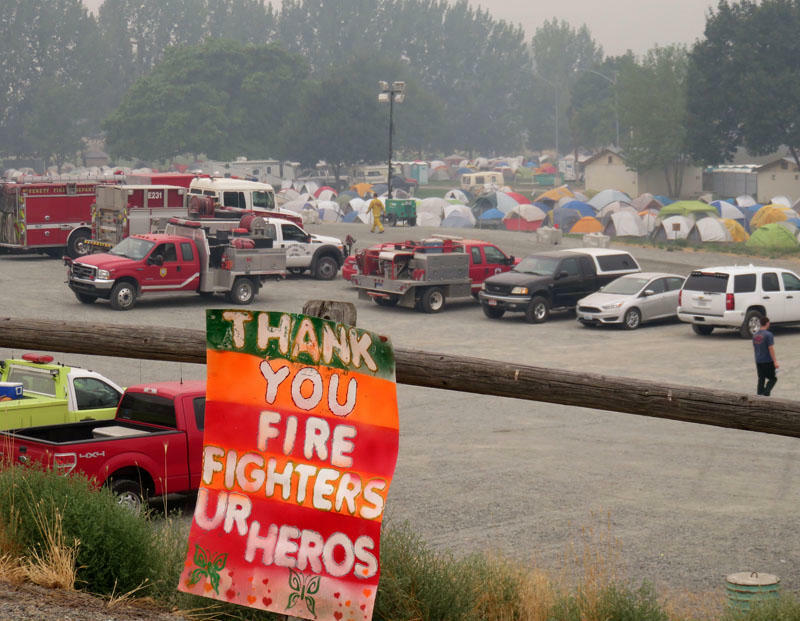 The Chelan Complex fires have grown to more than 112,000 acres and still have Lake Chelan surrounded. The air is so filled with smoke the horizon of the lake is no longer visible from the south end. 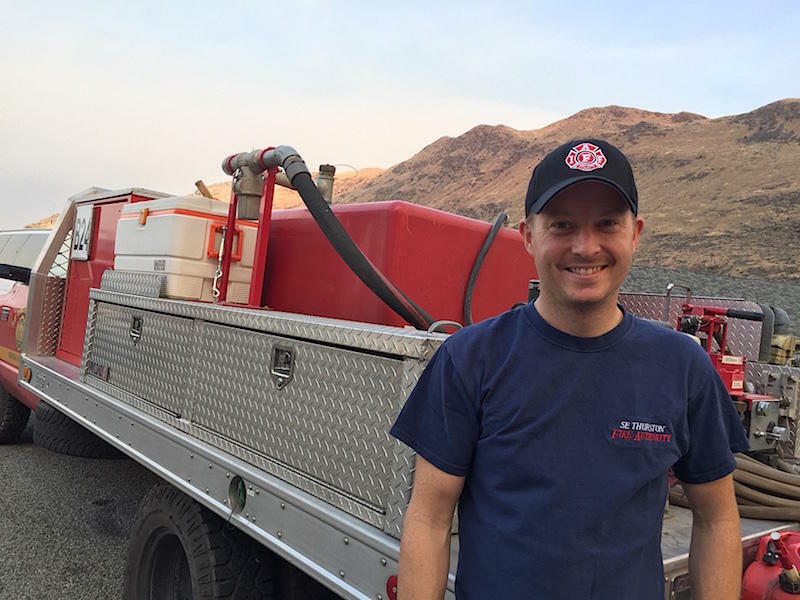 More firefighters continue to arrive on the front lines of the nation’s highest priority wildfire. It’s the 400 square mile complex of lightning-sparked fires near the Canadian border in north central Washington dubbed the Okanogan Complex.